The growth in popularity of moonwalkshas led to aninflatable rental industry which includes inflatable slides, obstacle courses, games,and more. ,Ltd is a professional manufacturer that specializing in developing, design, produce, sale as one of the amusement equipment . We are the manufacturer and have the excellent designer and professional skilled workers ,so we can do the best for you . commercial custom pvc inflatable ultimate combo unicorn bounce house Main Products Inflatable Bouncer Inflatable Slide Inflatable Tent 5K Obstacle Course Inflatable Sport Game Inflatable Swimming Pools Click Here to Send Me Inquiry The combo unicorn bounce house is a colorful Combo Jumpers that can be used for every party and event. 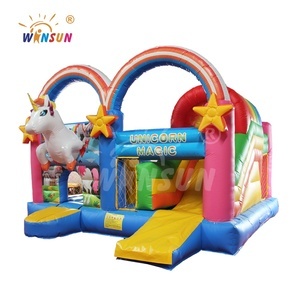 Besides having cheerful colors, images and an amazing 3D elements the combo unicorn bounce house also contain an awesome full color prints in Unicorn theme, exciting 3D obstacles and to top it off a slide. Children will be in awe and play on this combo unicorn bounce house with a smile on their face. 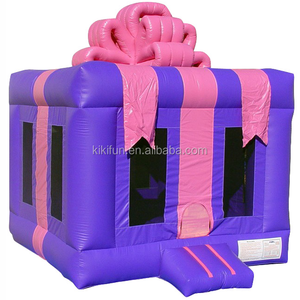 2.Our products include more than 100 kinds of inflatable items. 4.Innovation concept is our developing source. Related pictures for reference, more options available Dear Customer,we have more inflatable bouncers,pls contact us -Welcome to contact us Comany address:5th Floor, No. Can we change the size and color based on the original9 Yes, the size and color can be custom-made according to your requirement. Q. What kind of guarantee you give9 Our inflatable products can be used for more than 24 months. Because it is too long distance to ship goods back, we will send a kit bag for every inflatable product. 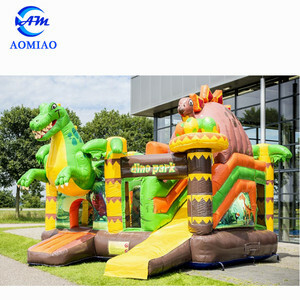 Alibaba.com offers 25,859 pvc bounce house products. About 92% of these are inflatable bouncer, 1% are advertising inflatables, and 1% are other amusement park products. A wide variety of pvc bounce house options are available to you, such as castle, slide, and playhouses. You can also choose from pvc, nylon, and vinyl. As well as from free samples, paid samples. 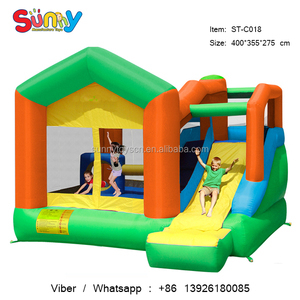 There are 25,775 pvc bounce house suppliers, mainly located in Asia. 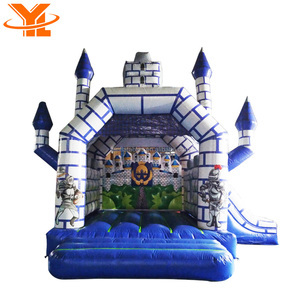 The top supplying countries are China (Mainland), United States, and Japan, which supply 99%, 1%, and 1% of pvc bounce house respectively. Pvc bounce house products are most popular in North America, Western Europe, and Domestic Market. You can ensure product safety by selecting from certified suppliers, including 2,546 with Other, 1,380 with ISO9001, and 730 with BSCI certification.